Jeffrey "Jaguar" Diaz, one of the biggest drug lords in Cebu, was laid to rest Monday, June 27. Photos show that hundreds attended his funeral. 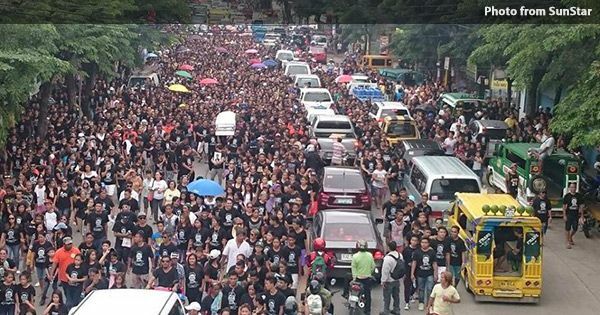 According to a SunStar report, security was tight at the funeral and mediamen were not allowed to enter the San Nicolas Parish where the mass was held around 1pm. The famous drug baron was like a rockstar who died a legend: a drum and bugle corps accompanied his hearse and his family and supporters wore black t-shirts with his face printed on it. Some supporters reportedly said the late narcotrafficker was kind to them. He was then brought to his final resting place — a mausoleum worth P200,000 excluding the expensive materials such as marble, limestones and tiles — at Calamba cemetery in Cebu City, the report said. Jaguar and his bodyguard were killed in a raid conducted by Cebu police on June 18 while they were rotating among his 8 houses in Las Piñas. Cebu City Mayor Tommy Osmeña, who broke the news using his Facebook account, said surveillance revealed that Jaguar "was setting up a new base of operations in Rizal."